Expanding food recovery programs is a critical action in a community’s overall strategy to reduce wasted food, but some efforts may deliver more community value than others. Oregon DEQ will speak to their cutting-edge, LCA research on the environmental, economic and nutritional trade-offs between different pathways to rescue and redistribute food. 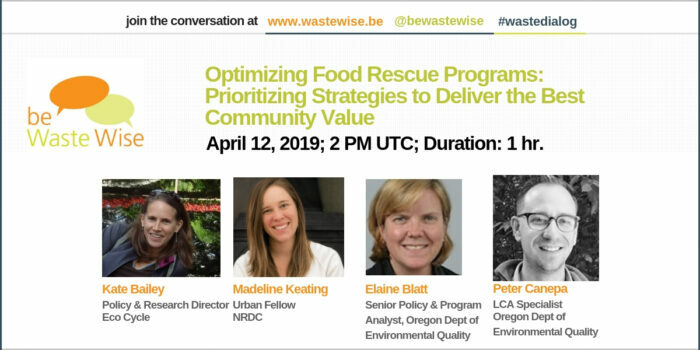 Natural Resources Defense Council (NRDC) will speak to their pioneering research to identify and model how much food could be rescued at the city level and which sectors offer the best opportunities for success. Together we will explore the promising potential of food recovery while also discussing the limitations of food rescue and the challenges of working within the larger food system. Madeline is an Urban Fellow with NRDC’s Healthy People and Thriving Communities Program and is the City Lead in Denver for NRDC’s Food Matters project. Her work is focused on urban sustainability issues including food waste, healthy food access, equitable communities, mobility and connectivity. Prior to joining NRDC, Madeline was involved with the Sustainable Neighborhoods Network in Lakewood, CO and worked a consultant on a healthy food access mapping project for Jefferson County Public Health Department. Madeline received her master’s degree in Urban and Regional Planning from the University of Colorado Denver. She holds a BA in Economics from Colorado College. Elaine Blatt is a Senior Policy and Program Analyst at Oregon Department of Environmental Quality. Her primary focus is on sustainable consumption and production of materials. She led development of DEQ’s Strategy for Preventing the Wasting of Food and manages DEQ’s current messaging research. Prior to joining DEQ, Elaine worked on projects related to sustainable production/consumption, energy efficiency, and supply chain management. She has a MA in Public Policy (University of Chicago) and a BA in Political Science (Carleton College). Peter joined the Oregon Department of Environmental Quality in January 2017, providing Life Cycle Assessment (LCA) expertise to Oregon’s Materials Management program. Peter’s primary role is to conduct and support projects that advance Oregon towards achieving its 2050 vision, through the application of LCA. Prior to this role, Peter spent 8 years with Thinkstep, a consultancy specializing in life cycle assessment. Peter holds a Master’s degree in Environmental Science and Management and a Bachelor’s degree in Environmental Studies. Kate Bailey is the Policy and Research Director for Eco-Cycle, based in Boulder, Colorado. Eco-Cycle is one of the largest recycling nonprofits in the world and has more than 40 years of hands-on experience in creating community infrastructure, policies and programs to reduce waste and increase recycling. Kate works directly with local citizens and governments to implement Zero Waste solutions at the local level as a critical solution to reduce climate pollution.